This rose is used on the His and Hers Christmas stocking pattern. This stitch will be explained using an IMAGINARY square. 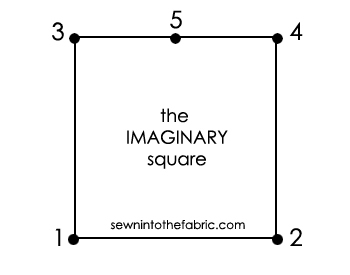 Do not mark this on your fabric, just keep the shape and the numbered points in mind as you work. Also, this diagram is not to scale. I made it big because i want you to be able to see it! You will be working with less than a 1/4" square as you stitch this out. Come up through corner 1, back down through corner 2 and up again at corner 3. 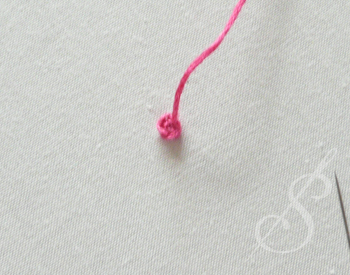 Slip the needle UNDER the stitch you just made (between corners 1 and 2), but NOT through any fabric. Pull the needle to the left, away from the working thread. 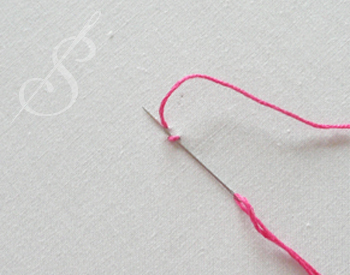 Take a second stitch in the same manner, but this time pull the needle to the right, OVER the working thread. Go down through corner 4 and back up at point 5. At this point you have a knotted center with a thread ("spoke") running out to each of the 4 corner points. 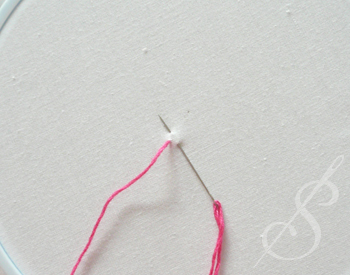 Now you are going to stem stitch around the center EXCEPT you are going to slide the needle under each of the "spokes" and NOT through the fabric. Slide the needle (from left to right) under spoke 2 and over the working thread. Pull this stitch into place, but not too tightly. This stitch is the first petal. Repeat Step 5 on "spokes" 1, then 3 and finally on spoke 4. This makes a very small rose, but if it is big enough to fill the space, you can end here. To do so, go down through point 5 and tie off. Stitch down through corner 2 and up through corner 3, over the working thread. 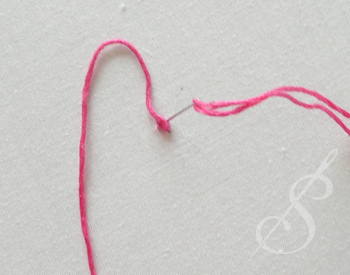 Pull this stitch into place, but not too tightly. Continue to work around the rose, adding 3 more stem stitches. If you want a larger rose, continue around as many times as necessary to get the size you want.